On behalf of Asheville on Bikes (AoB), I want to thank each of you who took the time to contact city leadership and let them know you support the continued inclusion of safe bicycle facilities in the RADTIP re-design. Several people responded to the call to action by emailing city leadership personal stories of the hazardous conditions they, their families, and friends encountered while riding in the RAD and expressed the need for city leadership to respond. Thank you for personalizing the message and sharing your stories. I know it made an impact on city leadership. We’re in this together and when you respond to an AoB call to action, you play a critical role in strengthening our organization and making our streets work for everyone. Thank you. We want council to direct staff to widen the greenway to 16 feet, with lane markings for cycling and walking, following FHWA standards; if that were impossible, we want to build the safest and best possible multi-use infrastructure suitable for a high-use corridor. 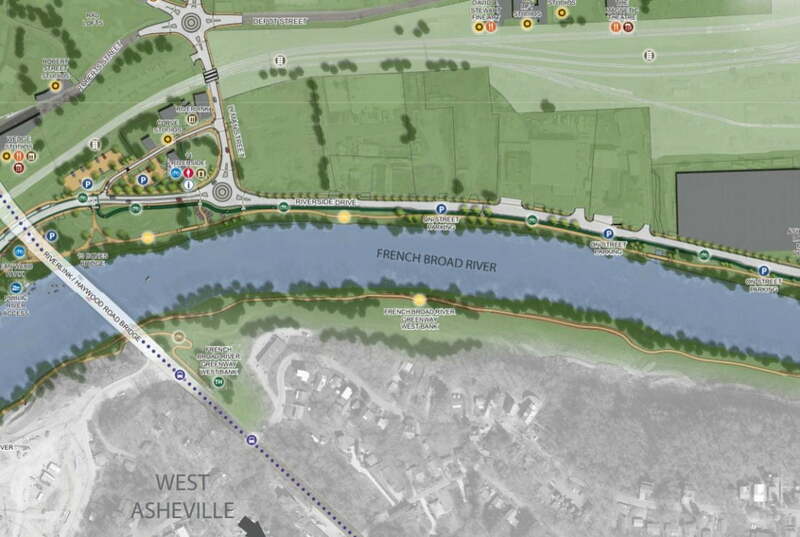 The section along Lyman will one day have both nearby walking traffic and through traffic from Swannanoa, East Asheville, South Asheville, West Asheville, Kenilworth, Biltmore Village, Woodfin, Weaverville, and Marshall. All of those people will converge on what is currently described as a 10 foot wide asphalt walking path. Our position is that this multi-use facility needs a change order as part of phase 1 in order to make it both useful and safe. Phase 1 must also include safety improvements to make the Riverside Drive rail crossing safe for cyclists. This project sets important precedents for future bicycle and pedestrian facilities. It is being closely watched locally, regionally, and nationally. You can watch Matt speak at 02:17:00 in the recorded version of the meeting. Regarding TIGER VI, staff directed to work with Norfolk Southern to make changes to the scope of work within the existing construction agreement, to modify the northern railroad crossing to ensure safe bicycle accessibility through the at grade crossing. Regarding TIGER VI, staff directed to commit to planning a community engagement effort which will prioritize the future phasing of greenway projects and prioritize re-engineering the multi-use path between the old 12 Bones and Amboy Road to accommodate an appropriate width to compensate for the loss of the protected bike lane, with said process being completed within 60 days. I encourage all of you who reached out to city leadership regarding the RADTIP re-design to send a quick letter of thanks to council and staff for responding promptly. A letter of thanks is important. Asheville on Bikes is committed to continuing to advocate for our position in the first phase of the project. We believe 16’ multi-use path along Lyman St and safe rail crossing on Riverside Rd are essential. We appreciate council and staff’s support of our position. I greatly appreciate AoB’s board of directors who devoted time and talent to make sure the voice of Asheville’s cycling community was heard. Thank you all for working to make Asheville a better place to bike. Please continue to follow and stay engaged with AoB as we continue to work toward better biking facilities for all. Vice-Mayor Gwen Wisler has asked that AoB reach out to the cycling community to learn more about the people who have been injured or who have fallen without injury at the rail crossing on Riverside Rd. Please share AoB’s Riverside Rail Crossing Injury / Incident Report with your circles as we’re working to inform staff and Norfolk Southern of the existing hazard. AoB is committed to advocating for strong infrastructure throughout our community now more than ever. As we’ve learned through our efforts in the RADTIP, even the best laid plans can come undone and continued engagement with local governments and other stakeholders is crucial to ensure our city is safe for all modes. Thanks again for your support with this effort! I encourage you to take a minute to learn about our other programs or support our work by visiting our website and join us for Summer Cycle on Saturday, July 29th. When you show, we grow. Debunking Common Myths About Cycling in Asheville—Yes, You Can Bike to Work.